Real estate issues come in a diversity of shapes and sizes; from documentation of a multi-tenant commercial lease to allegations of non-disclosure and broker negligence in the sale of a single-family residence. Whether you’re a buyer, a seller, a residential homeowner or a commercial real estate developer, Real Property Law and its application to your specific needs is crucial to your long term economic success. This is especially true in light of the recent economic downturn, where each case must be approached cost-effectively, with your ultimate objectives in mind. 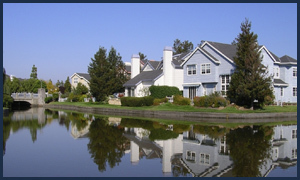 Whether you’re a residential seller with misgivings about required disclosures, a Trustee trying to protect wetland resources, a land owner with questions about title or permitted uses, or a developer/owner in dispute with tenants or a lender, working with an experienced and successful real estate litigation attorney is the best way to first avoid and then overcome conflict; and to do it in the most cost-effective manner. The Law Offices of Jeffrey J. Allen has over thirty years experience representing a diverse group of real estate owners, developers, commercial lessors, property management, real estate professionals, retail/business tenants and individual home-owners in a multitude of real property issues. While early negotiation and alternative-dispute measures (e.g., mediation) are always considered paramount, this law office takes pride in a stellar trial record in state and federal court, from litigating on behalf of international shopping center developers to representing defrauded buyers in the purchase of single family homes. Call us today for a complimentary consultation. You’ll be glad you did. Jeffrey Allen Trust & Probate Litigation assists clients throughout Sonoma County, Napa County, Marin County, and Mendocino County including Santa Rosa, Petaluma, Windsor, Sebastopol, Healdsburg, San Rafael, Novato, Ukiah, Sonoma, and Napa.